When I decided I would do a little advertising on this site I knew it would have to be for products that I adore. I could not send people off on a link towards something that I didn't use and endorse myself. As you can see from the photos below our house is organized using Mabel's Labels and we love them. The labels go through the dishwasher and the washer and dryer without an issue and best of all, little fingers cannot get them off. 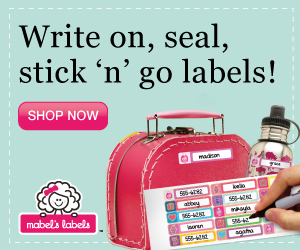 If your children are in daycare, pre-school, or school you need these labels to keep track of your children's items. I label all of the girls shoes and coats. I also label their drink cups and sandwhich containers. I have labeled special toys, sports equipment and books. 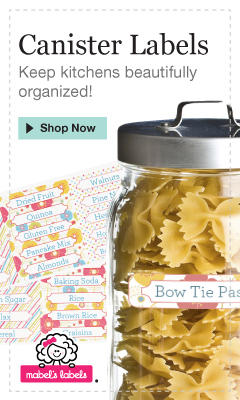 If they have a food allergy (hello GF/CF parents) these labels are a must-have. I have just discovered the allergy alert labels so they are next on my list. I also need the 'write on' labels to keep my pantry organized. See the links for these items below. If you choose to order please use the links below and help GoTeamKate receive a small commission. Thanks for having a look. We definitely want to keep track of our water bottles. The schools and daycares are overrun with Bogs. We like to make sure the girls wear the right ones home. We'll never mix up Grace's skis at the hill. Aren't these little skis the cutest?